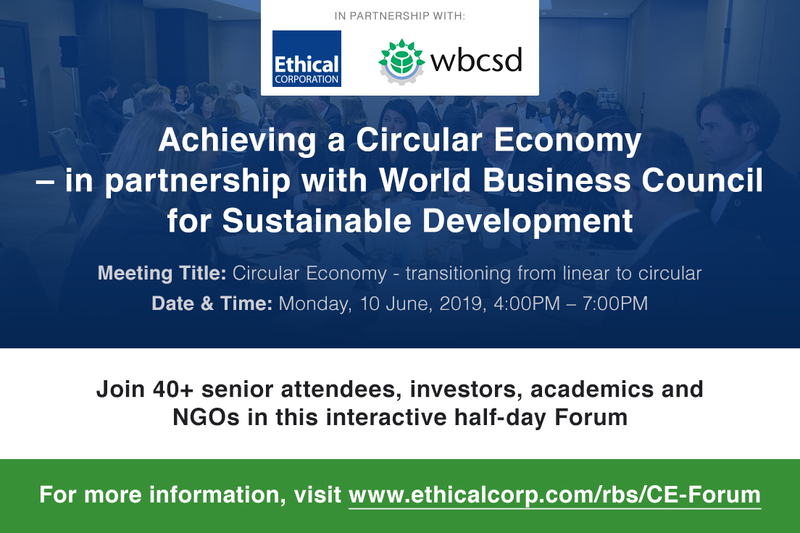 As part of their renewed partnership, WBCSD and Ethical Corporation will collaborate on a new partner-event Transitioning to a Circular Economy at the Responsible Business Summit Europe (10-12 June, London). The Circular Forum will bring together senior-level speakers and 40+ key players to share ideas and new innovations that will help your company and others move from a linear to circular model. All attendees will be invited to share their perspectives and experiences into what a 2050 closed loop economy looks like, the critical elements to achieve it and how each sector and industry can do their part. WBCSD is engaged in a series of activities to support business in the integration of circular economy by engaging within and across business to move the circular economy to deliver and scale solutions needed to build a sustainable world. This June, as part of the Responsible Business Summit Europe, WBCSD will join fellow expert peers and sustainable business professionals to share tools, strategies and ideas for companies to fully leverage the 2050 vision within business operations and unlock market opportunities. "We’re looking forward to working with Ethical Corporation to convene business leaders in the circular economy at our Responsible Business Forum workshop this June. This collaboration will offer workshop attendees an interactive experience with tangible outputs and actionable insights on circularity and the circular economy." said Brendan Edgerton, Director for Circular Economy at WBCSD. WBCSD is a global, CEO-led organization of over 200 leading businesses working together to accelerate the transition to a sustainable world. We help make our member companies more successful and sustainable by focusing on the maximum positive impact for shareholders, the environment and societies. Our member companies come from all business sectors and all major economies, representing a combined revenue of more than US$8.5 trillion and with 19 million employees. Our Global Network of almost 70 national business councils gives our members unparalleled reach across the globe. WBCSD is uniquely positioned to work with member companies along and across value chains to deliver high-impact business solutions to the most challenging sustainability issues. Ethical Corporation, established in 2001, has a mission to help businesses around the globe do the right thing by their customers and the world. Ethical Corporation serves CSR, compliance, risk and governance communities with topical and insightful business intelligence and meeting places. Ethical Corporation provides business intelligence to more than 3,000 multinational companies every year, and to NGOs, think-tanks, academia, governments and consultancies. In addition, they publish the leading responsible business magazine, website, and events – and organize conferences are widely recognized as the best in the field.